What Do You Know About Pinot? Pinot is one of the oldest known grape varieties in Europe thought to have been in existence for about 2000 years. It was first mentioned in the 13th century (as “Morillon”) in the Île-de-France region where Pinot was likely domesticated. This longevity makes Pinot a particulary interesting beyond it’s ability to produce great wine for two reasons: mutations and relations. For a long time variations such as Pinot Noir, Pinot Meuniere, Pinot Gris, and Pinot Blanc (to name the most well known) were thought to be varieties in their own right belonging to the Pinot “family.” Now, thanks to DNA profiling, we know that they and several others are mutations of the same single variety: Pinot (in fact black, white, grey, and even striped grapes can appear on the same vine!). The longevity of the variety has resulted in numerous mutations; there are over 1000 “clones” (mutations) registered with variations in berry color and size, leaf shape, cluster, and other qualities. A perhaps more interesting result of Pinot’s longevity is its relations. In their groundbreaking book, “Wine Grapes,” Jancis Robinson, Julia Harding & José Vouillamoz reference research showing that the variety has direct lineage relationships to many of the major and lesser wine grapes in eastern France, northern Italy, and the Germanic regions. Another ancient Western European variety, Savagnin (a.k.a., Traminer), has been shown by the Klosterneuburg research centre to have a parent–offspring relationship with Pinot, though it isn’t possible to tell which is parent and which is child. 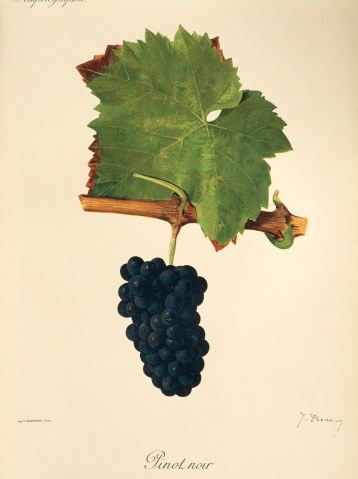 What is known, however is that thanks to this relationship, Pinot is “either a grandparent or a half-sibling of all the varieties that also have a spontaneous parent–offspring relationship with Savagnin,”* a list that includes such notables as Chenin Blanc, Petit Meslier, Sauvignon Blanc and Silvaner. Did you catch that? Sauvignon Blanc is a relative of Pinot, and quite possibly a grandchild. The grape-savvy among you already know that Sauvignon Blanc (with Cabernet Franc) is one of the parents of Cabernet Sauvignon. That means the two most widely-heralded varieties from northeastern and southwestern France likely have a great-grandparent/-grandchild relationship (and did not develop separately as previously thought)! Those grapes are a promiscuous bunch, aren’t they? *For further reading about Pinot and its numerous clones, I strongly recommend the chapter in the book “Wine Grapes.” by Jancis Robinson, Julia Harding & José Vouillamoz, and published by HarperCollins. An ebook edition is available via iBooks. All quotes were taken from the 2014 iBooks edition.